Developed by the University's School of Computing and Kent Business School (KBS) this dynamic digital solution would manage cross channel traffic in ways similar to air traffic control at airports. For example, during Operation Brock drivers would join the 'queue' as soon as they are ready to travel from anywhere in the country. When there are delays at the ports or Channel Tunnel they would then be advised to delay their journeys or take a break as soon as the delay is reported, often before they get to Kent. In effect the virtual queue can 'hold' hundreds of trucks at different locations across the country rather than physically in Kent. The held trucks can then be 'released' in a managed way via an app or text message. The system could also enable penalties to be imposed upon those drivers who ignore the virtual queue. * Ultimately the system could link to inland customs clearance. The research is led by Professor Said Salhi and Dr Jesse O'Hanley from KBS, and Dr Dominique Chu from Computing. Collaborative partners such as operators from Kent Resilience Forum whose members include Highways England, Eurotunnel, Port of Dover, Kent Police and Border Force, software providers and sector groups such as the automotive industry are being sought to ensure the long term viability of the project, which came about following the Keep Kent Moving Forum at the University's Canterbury campus during the summer of 2018. As part of the Forum delegates were required to come up with digital innovations that would address the issues caused by Operation Brock. 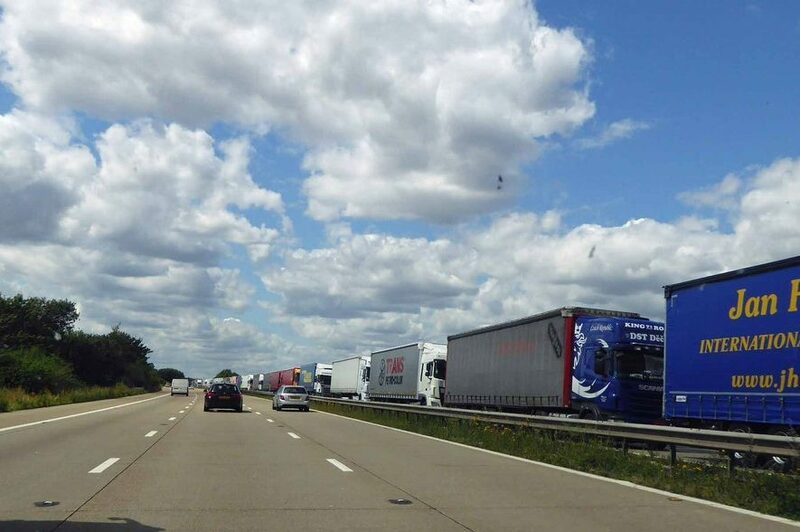 These include the expected delays and disruption that in the past have led to gridlock across Kent and the formation of Operation Stack to park lorries in Kent. The researchers are now seeking data sets to start to establish and test the ideas, aiming for a trial and phased introduction during 2019. The Dover sea crossing and Channel Tunnel at Cheriton provides the highest capacity for access to and from European countries for freight. Up to 5,500 trucks per day cross from the UK to France. Transport infrastructure is one of the key themes of the Kent Business Summit 2019 hosted by Kent Business School on the 11th January.